TThe Anglican convent of the sisters of St Laurence situated in Field Lane is a fine building of stone three storeys high erected in 1882/1885 at a cost of 12,000 pounds. The sisters were engaged in parochial visiting and nursing. The rule of the sisters was based on that of East Grinstead. The convent was erected on land purchased from the Strutt family. The foundress and first mother Superior was Ellen Lee who died in 1901. The gardens were carefully tended by a gardener and nearly every window had a colourful windowbox full of flowers. The building's fascia was covered over in Ivy at the end of the Victorian period. Quote from Novice during the 60's "The room on the ground floor, extreme right, was the "community room." This is where, for one hour each day, the sisters would gather together for an hour of recreation. This involved sitting around a big table in front of those windows, everyone had either knitting or sewing to do, no-one was allowed to ever be idle, nor was reading permitted at recreation. The windows on extreme left, top floor, contained what was known as the Novitiate. This comprised of a large sitting room, sparsely furnished with table and chairs, and many bookcases. Next to this was a small school room, with desks. This is where the novices would gather each afternoon, to be instructed in the Religious life by the Mistress of Novices. The recreational hour of the novices was spent in the sitting room, being invited to join the sisters only on special occasions." 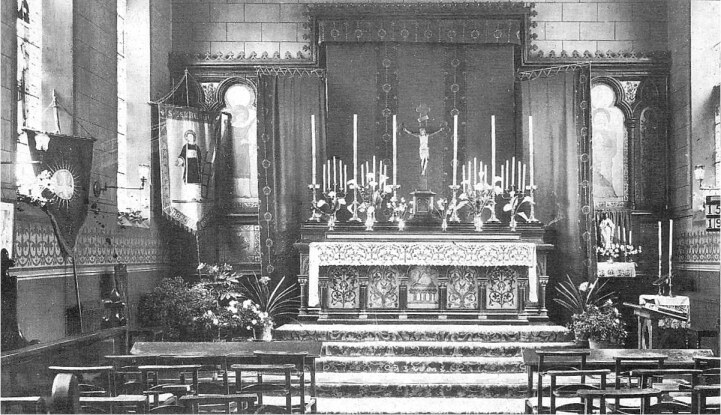 The chapel contained several stained-glass windows in the North and South walls and an organ in the West End. This picture was by Edward Bala around 1900. An orphanage and school were also run from the convent. The convent was converted into flats and houses in 2004 by Peveril Homes. While the three-storey brick houses surrounding the dormitory and chapel of the convent seemed incongruous at the time of building, and those of us who could remember the tranquil garden with its lawns, old trees and birdsong, we can begrudgingly say that it is not the absolute eyesore that we at first feared. One of the ladies who was a novice in the convent between 1966 - 1968 has kindly sent some information, a photo, and a poem. 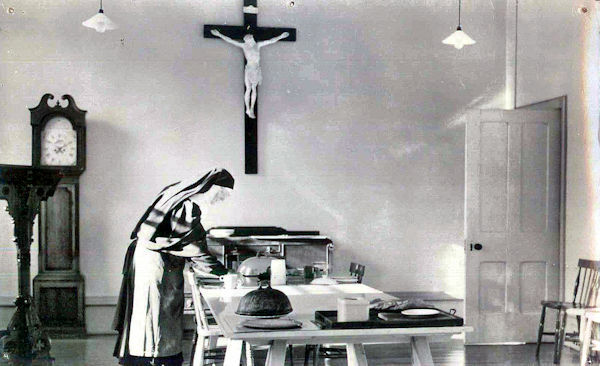 PHOTO: Postcard of Sister Joyce, Mistress of Novices, laying one of the tables in the refectory. There was a small "shop" situated in the cloister, which sold religious mementos and postcards of the convent for visitors. A hundred year old house that was built to be a shrine. For in those days i did believe that God was truly King. My faith was deep and precious, my God I wished to please. I tood the Veil, (a white one,) and there was no flagellation. The Convent was a good one, and helped my soul to grow. I still recall the incense and the faded, dusty psalters. And the Convent had a library which overflowed with books. But a sadness came to me today, I heard the nuns are selling. Bent and wizened brides of Christ, their story must be told. Their Mother House is to become luxury penthouse homes. The sadness of their ending chills my very bones. They said good-bye to Mother House, its portals they all kissed. For them I'd only wish for Grace, from their Lord and Maker. 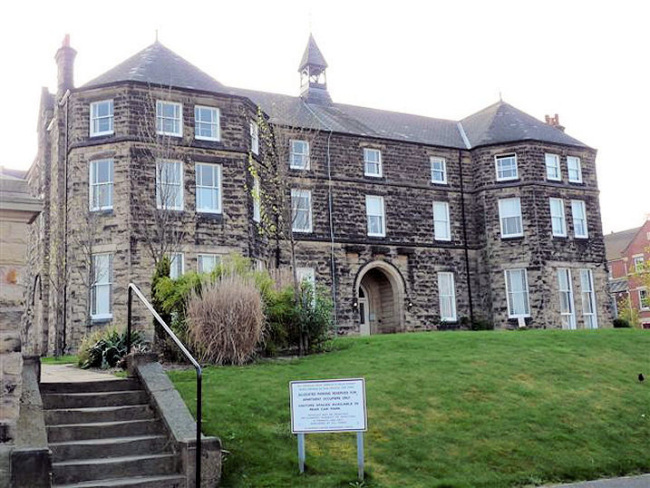 The Protestant order of St Laurence sisterhood was established in Belper in 1877 and Field Lane Convent was built on land purchased from the Strutts, with Father E.A. Hillyard, the Christchurch vicar, and Ellen Lee the foundress offered guidance. The Community of St. Laurence (CSL) is an Anglican religious order of nuns. Established in 1874, the order's house is located in Southwell, Nottinghamshire, England. The community was originally established to provide pastoral care, but now focuses more on retreat work and assisting at the cathedral of the Diocese of Southwell.